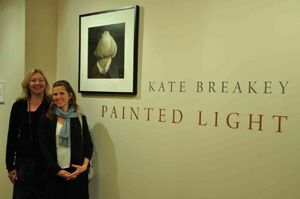 The Stephen L. Clark Gallery held a book signing for Kate Breakey’s Painted Light by University of Texas Press on Sunday night. 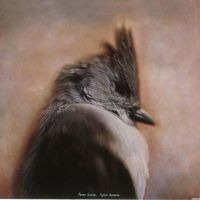 This is a follow up to her first book Small Deaths and is very much a retrospective from her earliest mathematical work and still lives through small deaths of flowers and birds, cacti, and memories and dreams. 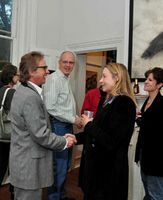 A Kate Breakey opening at the gallery is always a fun event. 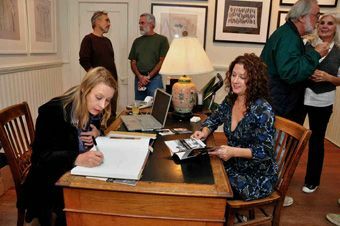 Andrea caught some fun photos of Kate meeting photographer James Evans for the first time and also Kate signing book. Do you know anyone in this photo? of Painted Light for her to personalize her signing to Steve and me – my friend and client Sondra Murray and I gasp and look at each other when we see a horse that looks like a mystical being galloping on the sand. We have been looking for just the right horse photo for her family room. Kate advises us that almost all of the photos in the book are on display at The Wittliff Collections at Texas State-San Marcos where they had a book signing the evening before. My Photos friend, Andrea Turner, pipes in that she would love to join us if we take a trip to San Marcos. The deal was done. We enjoyed a lovely morning at the Wittliff Gallery. It was an easy trip down I-35. Andrea’s comment at the exhibit was that it gave her a whole new appreciation for Kate as an artist and for just how hard she works. All of us felt it was a precursor to a museum show. If you make the short trip from Austin then have lunch at Palmer’s and sit in the garden paradise as Bill Wittliff suggested to us. Congratulation to Kate for another beautiful and enduring book. You can get signed copies at the Stephen L. Clark Gallery. 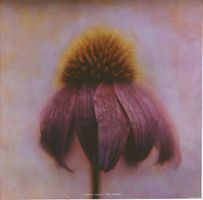 Painted Light at the Wittliff Gallery runs until February 4, 2011. Thank you for the photos Andrea.